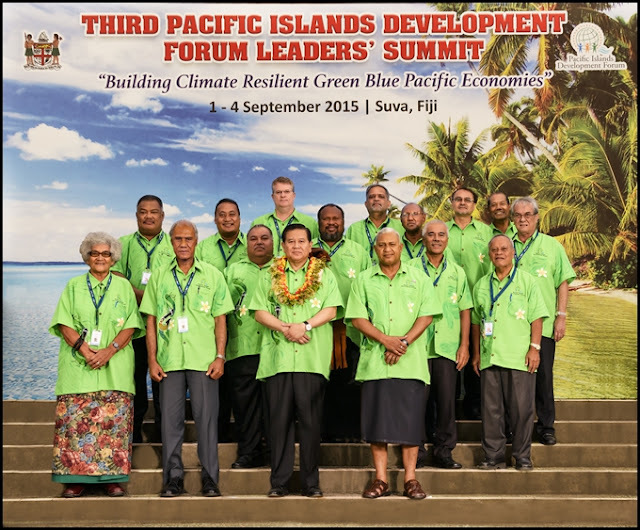 04 September 2015 (Office of the President): At the invitation of the Prime Minister of Fiji the Honorable Josaia V. Bainimarama to the Government of the Federated States of Micronesia (FSM) to attend the Third Leader’s Summit for the Pacific Island Development Forum (PIDF), Vice President Yosiwo P. George headed a delegation to participate in the 3rd Summit for the Pacific Island Development Forum (PIDF) from 2-4 September 2015 at the Grand Pacific Hotel in Suva, Fiji. The theme for the Third Leader’s Summit for the PIDF was “Building Climate Resilient Green Blue Pacific Economies.” During the plenary sessions at this PIDF, presentations were given on the challenges, leadership, partnership, and innovations for climate change resilient followed by the open discussions on the Pacific Path to the upcoming 21st Conference of Parties (COP) to the UN Framework Convention on Climate Change (UNFCC) in Paris early December this year. The two most important document outcomes of the Third PIDF were the approved Suva Declaration on the climate change, which represents the collective voices of the Pacific Island Countries on climate change, and the Charter of the PIDF. While in Suva Fiji, Vice President George submitted FSM’s proposal to phase out the hydro fluorocarbons (HFC) under the Montreal Protocol in the Suva Declaration, which was accepted by all leaders. The Pacific Leaders plan to use this Declaration to garner support at key meetings such as United Nations (UN) meeting on sustainable development, Commonwealth Heads of Government, the 21st COP at the UNFCC. At the last Friday, 04 September 2015, of the 3rd PIDF, Vice President George was amongst many leaders signed the Charter of PIDF, which launched the PIDF as an international organization. The PIDF Charter sets up the PIDF with respect to its purposes and functions; structure and processes; funding mechanisms; review process; dispute mechanism; and how it is to come into effect. The Charter was developed through many rigorous discussions, written submission, and workshops from all stakeholders. The FSM’s signing of the Charter signified FSM’s solidarity with the Pacific Island Countries in the PIDF. Pacific Island Countries that signed the Charter were: Fiji, Kiribati, Federated States of Micronesia, Republic of Marshall Islands, Nauru, Solomon Islands, Tonga, Vanuatu and the Pacific Islands Association of Non-Government Organizations (PIANGO). The members of Vice President’s delegation were Mr. Berlino Martin, Charge d’ Affairs of the FSM Embassy in Suva, Fiji, and Special Assistant/Advisor to the Vice President Mr. Herman Semes, Jr.